Sunshine, snow and quite slopes! It’s true that when you love something, you want to experience it over and over again. And if you’re a ski lover, who says you need to wait all year to enjoy it? In fact, skiing post ski season is actually more fun than when the slopes are packed with tourists and locals during peak season. For that reason, you should simply ski until your heart is content, at any time of the year. Don’t know where to go? No worries! We know of several really great ski resorts worldwide that are open during post ski season! Less people, fresher snow, and a bit of sun equals living the dream. This ski resort in France markets itself with one simple word: unique. And that’s exactly what they’re about. They breathe life into its guests, and offer impeccable skiing facilities, even after ski season has ended. At Val d’ Isère, you can expect to enjoy the slopes until May 1st. Grab your best friends, family, or lover and enjoy the spaciousness of post ski season in Europe. At Hintertux Glacier, you can ski all-year-round. Yeah, 365 days a year. Isn’t that simply perfect? Forget the blues when it comes to packing away your skiing equipment, Austria has you covered. This ski resort in Austria is the only one that is open 365 days a year, and is set at an altitude of 3,250 m. Enjoy their “perfectly groomed snow” any time of the year if you’d like to ski post season in Europe! Stepping into Rukatunturi ski resort in Finland is like a fairytale winter wonderland. Not only because you can enjoy cross-country or downhill skiing, but because they offer a ton of cool other things to do too. Fancy going on a husky safari? How about a reindeer sled ride? And when the sun goes down, you can enjoy a few cocktails and local cuisine. This ski resort in Finland has pulled out all of the stops. They’re open until April 30th, making them a great choice to ski post season in Europe. Passo Tonale encourages late season skiing in Europe, as they’re usually open until the middle of June. Which is why it’s a perfect spot for those who seek tranquility whilst on a skiing vacation. It’s a ski resort in Europe that accommodates skiers of all levels, with the longest decent being 11 km long and the highest lift being 3,030 m high. They’ve been awarded five stars for their quality of snow, and promise to be snow-sure all season round! As well as being a great location for late season skiing in Europe, Riksgränsen ski resort offers other services and experiences that only add to its charm. Here, you can find great travel and lodging options, restaurants, competitions and events, and team building initiatives for companies. You can also enjoy other activities such as dog sled tours and snowmobile tours. This ski resort in Sweden is open until around the end of May, and sometimes until the end of June depending on circumstances. What’s also great about this late season skiing location, is that it boasts 4.7 stars from nearly 2,000 customer reviews on Google. What does that mean, essentially? That you’re in for a real treat and an amazing experience, guaranteed. So, if you decide to take a mini vacation to this ski resort in Canada, you can enjoy some late season skiing until May 27th. Definitely worth a ponder! Squaw Valley is a ski resort in California that likes to describe their location as an “unlimited playground”. They’ve been blessed with three Best Ski Resort in North America awards by USA Today, and have received a number of other high-esteemed acclamations for their great service. This ski resort in California spans over 6,000 skiable acres, and is suitable for skiers of all levels. They also have slope-side lodging nearby with lots of fun things to do – such as over 50 bars, restaurants, and shopping. Squaw Valley is open until May 31st and basically, visiting this ski resort is to combine a few of the 300 + sunny days California has to offer with gorgeous fresh snow and unforgettable experiences. Furano is a powder resort that has two zones, Furano and Kitanomine. This ski resort in Japan is mostly dedicated to beginners and intermediate skiers, but do offer some terrains for the more advanced. Their amenities and services are well-developed, and the ski resort itself gives off a real authentic experience. It also caters to English-speaking guests without compromising the Japanese cultural feel. In the area, you can stay in one of two Prince Hotels, and the island of Hokkaido has a lot of great things to do when it comes to sightseeing. Enjoy the Kitanomine zone until March 25th and the Furano zone until May 6th. Simply put, to enjoy late season skiing is to indulge in the finer things in life. 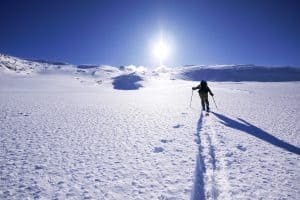 There are so many benefits of skiing during off-peak season, and if you have the time and opportunity, we strongly recommend you give one or more of these ski resorts in Europe, North America, or Asia a try.